In this blog, Paul Rumley, who specialises in claims on behalf of disabled people who suffer injury as a result of medical negligence, discusses some recently published and thought provoking statistics on disability and work. Looking at a recent report from SCOPE (A Million Futures: Halving the Disability Employment Gap) I was struck by just how hard it is for disabled people to get into work, if they are able and choose to, and what a loss to our economy and our society that is. In some respects, the statistics speak for themselves and I have prepared an infographic below highlighting some of the key statistics from the report. So what are the problems, the solutions and what are the potential results if we try to do what we need to do? • The majority of disabled people can and want to work. It is estimated that there are 1 million disabled people who could work with the right support and interventions. 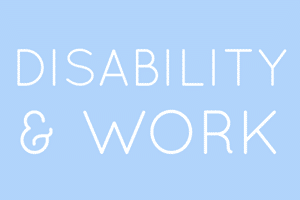 • For disabled people who get a job, or are working when they become disabled, they find it difficult to keep a job because of a lack of flexibility in the workplace. • A lack of flexibility in terms of leave if their medical condition changes. • This means a loss of disabled workers as a result of inflexibility, and in particular in respect of sick leave, with employers losing their contribution to their workforce and the Government (and we as taxpayers) therefore has to pay more in benefits. • There are lots of disabled people in public sector jobs who are therefore disproportionately affected by the cuts in the public sector workforce. • It is estimated that 654,000 disabled people are now expected to find work as a result of the Government’s benefits changes. • Effective and personalised support for disabled people – paid for with a transferable personal budget – to find, stay in and progress at work. • A dedicated innovation fund for disabled people’s organisations to increase the network of specialist employment advisors for disabled people. • More inclusive workplaces with flexible leave for the times when disabled people have changes in their personal or medical circumstances. • Funding as part of the New Cities initiatives to target creation of jobs for disabled people. • Continuing employment support after a disabled person gets a job, for example to pay for adjustments to their place of work to accommodate their needs, workplace adjustments, support workers or help with the increased costs of getting to and from work. The most important outcome is that disabled people are able to fulfil their own aspirations and opportunities. On a practical level, they can become more financially secure and independent thus reducing the benefits bill. I am staggered that it is estimated that if more disabled people were better helped to get into and stay in work, then this could add £13 billion to the UK economy. When I handle a clinical negligence claim on behalf of a disabled person, my ultimate goal is to get them compensation which will allow them to develop and progress to achieve the best they are capable of – which is just what we all want isn’t it? It seems to me that if we have an untapped element of the workforce, made of disabled people who are able and want to work, and that can reduce the benefits bill at the same time as increasing our economy following a long and hard recession that has to be, in colloquial terms, a “no brainer”? Withy King’s specialist team of lawyers work in partnership with SCOPE, and seek to help disabled people who have been injured as a result of medical negligence. If you want to discuss any of the issues raised in this blog, or anything more generally in respect of the medical treatment you or a loved one has received, please contact our specialist team.